The body of Thomas L. Clardy was returned Thursday afternoon to a funeral home in Hudson, where residents lined Central Street in his honor. 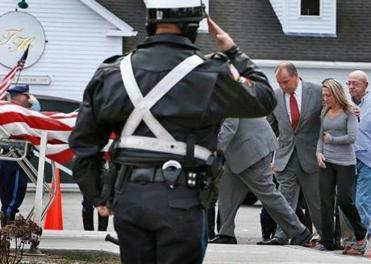 HUDSON — The body of Massachusetts State Police Trooper Thomas L. Clardy was returned Thursday afternoon to a funeral home here, where residents lined Central Street in his honor. Some held American flags while others stood quietly as a police motorcade pulled up to Tighe Hamilton Funeral Home. Clardy’s coffin was draped with an American flag. 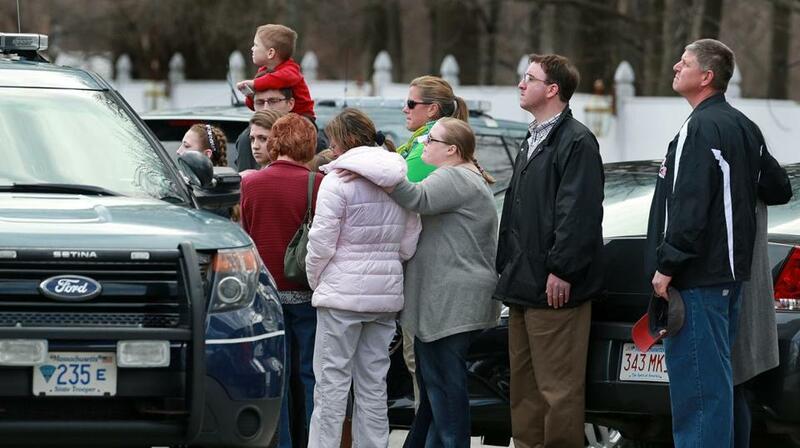 “I didn’t know him personally, but I wanted to come out and pay my respects,” she said. Clardy, a 44-year-old married father of six children, was killed Wednesday during a routine traffic stop after he was struck in the breakdown lane by a car that had veered across three lanes of the Massachusetts Turnpike in Charlton. As Clardy’s body was returned to Hudson, a group of local mothers walked through the downtown, tying American flags around poles with blue ribbons in honor of the trooper and his family. A wake for Clardy will be held Monday in Hudson, and his funeral will be held Tuesday at St. Michael Parish in Hudson. The Webster man whose car struck Clardy’s cruiser remains in intensive care at UMass Memorial Medical Center in Worcester. David Njuguna, 30, suffered a concussion, two broken wrists and a thigh wound in the crash, according to a relative who visited him at the hospital Wednesday night. The relative said Njuguna has no memory of the crash and could not provide details about what happened. Njuguna’s license was suspended for 180 days in October 2013 when he refused to take a breathalyzer test after being stopped by police in Oxford, according to Registry of Motor Vehicles records. His license was reinstated in June 2014 after he paid a reinstatement fee, and it was valid at the time of Wednesday’s crash, according to the records. Njuguna’s relative said a charge stemming from that incident was dismissed, but could not provide details about the circumstances. A clerk at Dudley District Court, which includes Oxford in its jurisdiction, said there were no criminal or civil public records involving Njuguna. Asked what could have caused Njuguna to abruptly swerve across traffic and into Clardy’s cruiser, the relative said it was incomprehensible. The only medical condition Njuguna has that he is aware of is asthma, he said. On Thursday, Njuguna didn’t even remember that his family had been by his bedside the night before. It’s unclear how long Njuguna will remain in intensive care, according to the relative, who said Njuguna lost consciousness while being airlifted to the hospital and was not responding to treatment as quickly as doctors had hoped. Njuguna is currently charged with negligent operation of a motor vehicle and failing to stay within marked lanes, charges he will face in Dudley District Court at a future date. A native of Kenya, Njuguna came to the United States around 2009 and works as a medical technician, the relative said. He is a legal permanent resident. At the request of the State Police, the Registry of Motor Vehicles revoked Njuguna’s right to drive as an immediate threat to the driving public given his alleged role in the fatal crash, the first line of duty death for the State Police since 2011. According to State Police, Clardy had pulled over a Chevrolet Tahoe for a driving infraction around noon Wednesday and was in the driver’s seat of his Ford Explorer at the time of the crash. Clardy was extricated from the wreckage and rushed to UMass Memorial Medical Center in Worcester, where he was pronounced dead. He had worked for the State Police since 2005. Dana A. Pullman, president of the State Police Association of Massachusetts, said Clardy was working a speed enforcement detail on the Massachusetts Turnpike when he was killed. After working that detail, Clardy planned to do his regular 3 p.m. to 11 p.m. patrol shift out of the Charlton barracks, Pullman said. Pullman said he last spoke to Clardy about two weeks ago and asked him about his new house. “He says, ‘Oh, it’s great!’” Pullman said. John R. Ellement of the Globe staff contributed to this report. Astead W. Herndon can be reached at astead.herndon@globe.com. Follow him on Twitter @AsteadWH. Laura Crimaldi can be reached at laura.crimaldi@globe.com. Follow her on Twitter @lauracrimaldi.